Since I moved into our new home, I get a depressingly small amount of mail. I am pretty sure that I did all the proper 'mail forwarding' steps and notified all my credit cards, etc of the move - but I barely even get any junk mail anymore. It's sad. So, needless to say, I cannot explain the joy each month when my 'Bon Appetit' and 'Food and Wine' magazines show up. Not only do they fuel my passion for recipe-reading, but they also count as mail. For me. Food and Wine has a lot of odd recipes. Many that I often want to try, but am a little too weirded out by the addition of strange things like fennel. I have never seen so many recipes that call for fennel. This recipe also falls into the odd category. 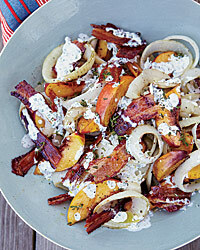 Bacon - Peaches - Onions - Mint - Buttermilk Dressing???? Weird. But, it caught my eye. It looked so amazingly delicious to me that I knew I wanted to make it the second I laid eyes on it. And boy was I glad. Serve this for a summer dinner party and your guests will be impressed by the amazing flavor and originality of this dish - and don't tell them you got the recipe from Food and Wine, so they think you're a real food pioneer. Recipe here. Also, if you're thinking that photograph looks shockingly good for my blog, I didn't take it. I forgot to take one all together. But, mine looked exactly the same so I don't feel all that fraudulent.